I'm so excited to announce that LovleyParis' website is now LIVE and ready to be visited! I have spent days making it look great and I still need to add pages and other things to it, but it is ready to be seen by all of you guys! I have been working on some templates to put for sale and you can see them on the website soon. I cannot wait for you guys to see the rest of the templates that I have done and I really hope that you all like them. Lovely Paris is back and better than ever and I am thrilled. Hopefully this will be the beginning of something great! What can you find on the website? Lots of Gold and Pink! I feel like those two colors are very popular at the moment and they are also my favorite ( hint: the colors of my blogs too ! ). You will also see a modern twist to it. Stylish and clean but also cute.You can also see our prices when it comes to Custom Designs and our Premium Blogger Templates. Also, you will be able learn a little bit about how I decided to start LovelyParis Designs and all about m.! I will also have a blog all about LovelyParis and designs and tutorials on how to add things to your blog to make them shine. I will probably end up re designing it like a thousand times like I do with my blog all the time, but it keeps things interesting right? 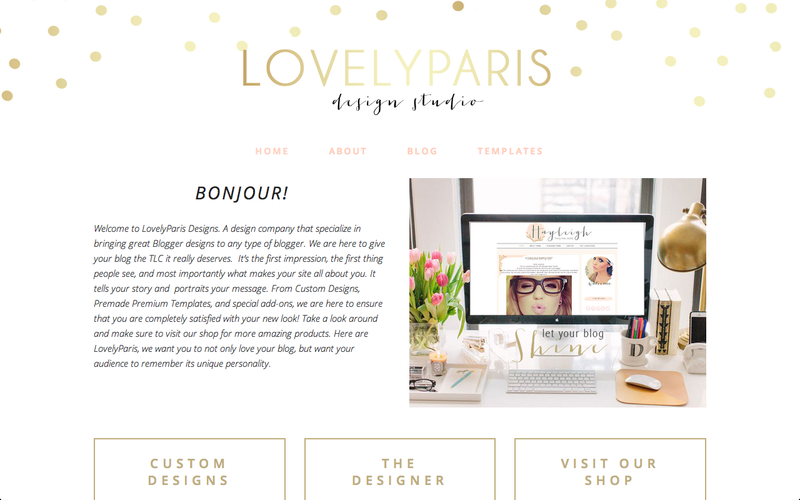 Well, If you want to know anything else about LovelyParis Designs, then just leave me a comment and make sure to visit our site which is still sort of in the works ( need to get a domain name and all of that ). So yes, Im a really excited and if you need any add ons to your blog or a make over, Let Me Know!